Mandevilla (Mandevilla spp.) are tropical vines with large, brightly colored flowers that bloom over and over throughout the warm season. They survive outdoors only where temperatures stay above freezing year round, but are often grown in pots and brought indoors for the winter. 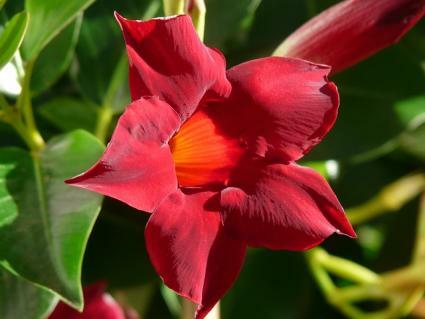 Mandevilla has a quintessential tropical appearance with 2- to 4-inch trumpet-shaped flowers in shades of red, yellow, pink and white and glossy green leaves up to 8 inches long. They are profuse bloomers and even small potted plants will be covered with flowers if given the right conditions. The vines can grow to 20 feet or more when planted in the ground, but potted specimens are likely to be half that size at most. Partial shade, abundant moisture, excellent drainage, and regular fertilizer are the keys to growing mandevilla successfully. 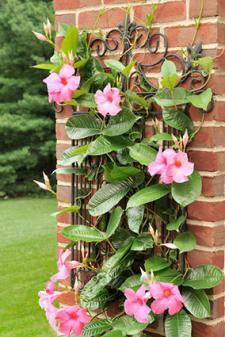 It is best to grow mandevilla outside in USDA zones 9 - 11. Mandevilla needs the support of a trellis to grow on, which may be incorporated directly in the pot so that it can easily be moved indoors for winter. It is not a heavy vine, so any lightweight trellis, such as wooden lattice, works fine. If the trellis is outside the pot, the vines may be cut at the base when it's time to bring the plant indoors for winter -- the vines re-sprout readily from the roots. 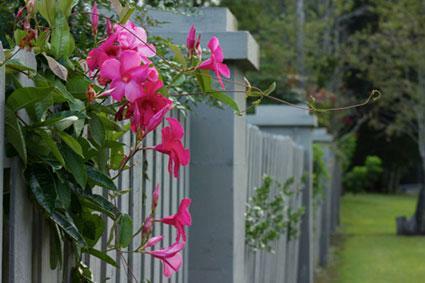 Mandevilla is most often used as a seasonal patio plant where it will brighten any partly shaded area. It also has several other common uses. It may be used in hanging baskets. In areas that are warm enough to plant it in the ground, mandevilla may be used over arbors and pergolas or to cover a fence. It will not survive indefinitely indoors, but it is often used as a short-term houseplant. Place it in a room with bright indirect light rather than a window with direct sun. Use a lightweight potting mix as a growing medium and make sure that the crown of the roots is even with the soil line when transplanting. For best results, bring mandevilla indoors whenever temperatures dip below 50 degrees. Water mandevilla whenever the surface of the soil becomes dry. During the heat of summer, a potted mandevilla will likely need to be watered every day. For the most abundant blooming, fertilize every two weeks with a product high in phosphorus, such as 10-20-10. Sucking insects, such as aphids, mealy bugs, mites and scale, are the most common problems associated with mandevilla. Insecticides may be used, but consider insecticidal soap as an all-natural option before resorting to harsher chemicals. Often, blasting the bugs away with a sharp stream of water is sufficient for minor infestations. Cutting back on fertilizer also helps to prevent sucking insects who prefer to feed on the most tender, succulent growth. Pest problems are most damaging to mandevilla when it is grown indoors where there are not natural predators. For this reason, it is important to make sure there are no pests on the plants when they are brought inside. Check under the leaves and in every nook and cranny of the plant for bugs and their eggs and make sure these are removed before moving the plant inside for winter. Stop fertilizing during the winter and cut back on watering, allowing the surface of the soil to dry between waterings. Remove the oldest vines to freshen up the plant before putting it back outside in the spring. Mandevilla is grown from transplants, rather than seed, and is commonly available in nurseries in the spring and early summer. 'Red Riding Hood' has dark red flowers. 'Summer Snow' has pure white flowers. 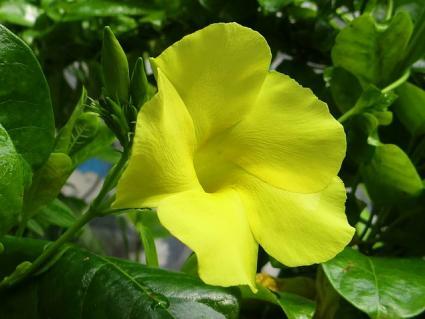 'Yellow' has large golden flowers on a compact plant. Along with hibiscus, mandevilla is one of the classic tropical plants available to temperate climate gardeners. It's possible to overwinter them indoors, but you can also treat them as an annual and just enjoy them on your patio of balcony for the summer.